Where can I locate research funding opportunities? How do I develop a competitive proposal? Where do I find the UD data I need to complete my budget? You’ll find the answers here, courtesy of the Research Office. A handy proposal checklist also is provided for your convenience. Remember, it takes time and effort to develop a successful proposal — in fact, proposal success rates average 20–33%, depending on the field. Funding agencies reject half the proposals they receive because the applicant did not follow instructions or the proposal did not match the funding program. However, the rewards for garnering research funding can be great, enabling you to explore new frontiers, instruct your students in the conduct of research, and yield new discoveries and knowledge of benefit to society. *All proposals submitted to external sponsors from the University of Delaware, regardless of the amount, source of funding or the type of project must be reviewed and approved by the Research Office in accordance with UD’s External Sponsorship and Grant policy. For a proposal to be submitted, a proposal record must be created in the UD grants module system. This will originate a form to route for approval of the proposal submission. SF424 RR ● Remember to use 9 digit zip codes. Remember standard start dates apply for NIH. Field 11, Descriptive Title, is limited to 200 characters. Field 15, auto filled based on data entered into the RR Budget or PHS 398 Modular Budget. Field 19, Authorized Representative, email should always be udelaware-awards@udel.edu. Authorized representative is determined by first year total costs. Field 21, Cover Letter Attachment, NIH strongly encourages a cover letter. RR Performance Sites ● If 50% or more of the work will happen off-site, UD cannot claim F&A expenses under the standard rate. The off-campus F&A rate will apply. RR Other Project Information ● Complete questions 1-6. Proposals that indicate use of human subjects are required to complete the PHS Human Subjects and Clinical Trials Information. Proposals that indicate use of animals are required to submit Vertebrate Animals section. See PHS 398 Research Plan for more information. Other Attachments should only be included when required by the solicitation. NIH Salary Cap ● Salary must not exceed NIH cap for faculty Salary cap summary: https://grants.nih.gov/grants/policy/salcap_summary.htm or graduate students cannot exceed the “0 Level Post Doc” stipend rate, inclusive of stipend, fringe, and tuition. On the budget justification, include a statement indicating the PI/Other Personnel (as appropriate) are budgeted at the NIH Salary Cap. (*Use when required or allowed by the solicitation) ● Typically used when direct costs exceed $250,000 per year (excluding subaward(s) F&A). If this type of budget is used and you have subawards in your budget, you will also need to complete the RR Subaward Budget Attachment. Budget Justification for all requested costs. (*Use when required or allowed by the solicitation) Modular budgets are applicable to certain research grant applications requesting direct costs of $250,000 or less per year (excluding subaward(s) F&A). The modular budget is applicable only to R01/U01, R03, R15, R21/UH2, R34/U34, and R15/UA5 applications. For all modular budgets, request total direct costs (in modules of $25,000 up to $250,000), reflecting appropriate support for the project. There will be no future year escalations (see above SF424 Budget for explanation). Personnel Justification - include the name, role, and number of person-months devoted to this project for every person on the project. Do not include salary and fringe benefit rate in the justification. Consortium Justification - include the total costs (direct costs plus F&A costs), rounded to the nearest $1,000, for each consortium/subcontract. Additionally, any personnel should include their roles and person months; if the consortium is foreign, that should be stated as well. Additional Narrative Justification - include explanations for any variations in the number of modules requested annually. Also, this section should describe any direct costs that were excluded from the total direct costs (such as equipment, tuition remission) and any work being conducted off-site, especially if it involves a foreign study site or an off-site F&A rate. RR Subaward Budget Attachment ● Only required when using RR Budget not PHS398 Modular Budget. Complete RR Performance Sites and RR Key Persons forms. Check “Include in Prime” as appropriate. Complete RR Budget Form and upload the subaward’s budget justification. (Not required for Career Development Award (K) or Institutional Training Award (T) applications.) ● Research Strategy should address (1) Significance, (2) Innovation, and (3) Approach. Introduction to Application – only required for Resubmission and Revision applications. Research Strategy (limited to 6– 12 pages) – See http://grants.nih.gov/grants/forms_page_limits.htm for full list of page limitations. Progress Report Publication List – only required for Resubmission and Revision applications. Vertebrate Animals – to be completed when RR Other Project Information indicates use of animals. Consortium/Contractual Arrangements – Upload a letter of intent signed by an Authorized Representative of the subawardee organization. Resource Sharing Plan – only required under certain circumstances. See NIH GPG Part I Section 5.5. Authentication of Key Biological and/or Chemical Resources—required if Biological and/or Chemical Resources will be used. 1 page is suggested. A negative statement is not required. Appendix - Maximum of 10 allowable appendices. See NIH Notice Number: NOT-OD-18-126 for updated list of allowable appendix materials. (Required only for Career Development Award (K).) ● Letters of reference required. Type Density Type density, including characters and spaces, must be no more than 15 characters per inch. Type may be no more than six lines per vertical inch. Paper Size and Margins Use standard paper size (8 ½" x 11). Use at least one-half inch margins (top, bottom, left, and right) for all pages. No applicant-supplied information can appear in the margins. Page Formatting Use only a standard, single-column format for the text. Do not include any information in a header or footer of the attachments, including page numbers. No restriction, although black and other high-contrast text colors are recommended since they print well and are legible to the largest audience. Figures, Graphs, Diagrams, Charts, Tables, Figure Legends, and Footnotes You may use a smaller type size but it must be readily legible and follow the font typeface requirement. Proposal Attachments All proposal attachments should be in PDF form. File names can contain the following: A-Z, a-z, 0-9, underscore, hyphen, space, period, parenthesis, curly braces, square brackets, tilde, exclamation point, comma, semi colon, apostrophe, at sign, number sign, dollar sign, percent sign, plus sign, and equal sign. NIH recommends avoiding the use of ampersand. Filenames must be 50 characters or less (including any spaces between words) and you can only have single spaces between words in filenames. Requested effective dates must allow at least six months for NSF review, processing and decision. International Research/Education/Training Activities. List the primary countries involved on the Cover Sheet. The Project Summary may ONLY be uploaded as a Supplementary Document if use of special characters is necessary. Include if the PI or Co-PI has received NSF funding with an End Date or current funding (including NCEs) in the past 5 years regardless if directly related to proposal or not. NOTE: Do not need to put “none” for Co-PI if PI has work. If the project was recently awarded and there are no new results, describe major goals and broader impacts. If the proposal is for renewed support, a description of the relation of the completed work to the proposed work. Other personnel including postdocs, student assistants, or professionals can include information on exceptional qualifications that merit consideration in the evaluation of the proposal. The number of person-months per year to be devoted to the project, regardless of source of support. Must be uploaded as a single file per each Senior Personnel associated with the proposal. “This Proposal” submitted by PI must be listed as pending. If more than two months of salary in any one year is requested, justification for requesting more than 2 months should be included. The names of the PI(s), faculty, and other senior personnel and the estimated number of full-time-equivalent person-months for which NSF funding is requested and the total amount of salaries requested per year are listed. If PI/Co-PI salary is not requested, their names should not be included in the budget. Participant Support requested includes information on the number of participants to be supported. Subawards have a separate budget. Post-docs, if budgeted, require a mentoring plan in supplementary docs. 5 pages max; if subawards are included, each subaward justification is limited to 5 pages. Equipment is justified, listed individually by description and estimated cost. International travel is justified including countries to be visited (also enter names of countries on the proposal budget), and dates of visit, if known. Only existing resources directly applicable to the proposed work are described. Any substantial collaboration with individuals. Letters of collaboration should be limited to stating the intent to collaborate and should not contain endorsements or evaluation of the proposed project. The PAPPG suggests standard language to use in letters of collaboration. List suggested Reviewers or Reviewers not to include. Include mail address and institutional affiliation. For reviewers not to include, the reason why should be included. Collaborators & Other Affiliations Information must be separately provided for each individual identified as senior project personnel in the proposal. Must use NSF Excel template; include directions and upload as Excel, allow Fastlane to convert to PDF. Do not alter template. Information is not required to be sorted alphabetically. If a postdoc is included in the budget, then a postdoc mentoring plan is required. Limited to 1 page for entire proposal. Font Use Arial (not Arial Narrow; mac users may also use Helvetica and Palatino), Courier New, or Palatino Linotype at a font size of 10 points or larger; Times New Roman at a font size of 11 points or larger; or Computer Modern family of fonts at a font size of 11 points or larger. A font size of less than 10 points may be used for mathematical formulas or equations and when using a Symbol font to insert Greek letters or special characters. Figures, Graphs, Diagrams, Charts, Tables, Figure Legends, and Footnotes can have smaller size font, but must comply with type density guidelines and be readable. Type Density When printed, text in the entire proposal (including figure captions) may be no more than six lines per vertical inch. Paper Size and Margins Standard page size (8.5 x11) with 1 inch margins in all directions required. Page Formatting Use only single column formatting. Include page numbers. Hyperlinks Can use anywhere except project description, ok if link text in blue. Figures, Graphs, Diagrams, Charts, Tables, Figure Legends, and Footnotes You may use a smaller type size but it must comply with type density guidelines and be readable. Principal Investigators and Co-Principal Investigators have primary institutional responsibility for providing scientific/technical leadership and administrative and financial management of sponsored projects. As such, the University has defined who is eligible to serve as Principal Investigator or Co-Principal Investigator on sponsored projects. This form is provided as a guide to use when preparing a proposal for submission through the Research Office. Download Proposal Information Form. Subawards are awards provided by a pass-through entity to a subrecipient for the subrecipient to carry out part of a Federal award received by the pass-through entity. It does not include payments to a contractor or payments to an individual that is a beneficiary of a Federal program. A subaward may be provided through any form of legal agreement, including an agreement that the pass-through entity considers a contract. Obtain the items listed in the applicable table below, depending on whether or not the subrecipient institution is a member of the FDP Expanded Clearinghouse (see below for explanation). Attach a completed UD FDP Letter of Intent to the Attachments Tab of the UD proposal when routed for internal approvals, to be signed by the Research Office Contract and Grant Administrator. Do not complete a Subrecipient Information form for the other institution. If they request that you do, politely remind them that UD is a member of the FDP Expanded Clearinghouse (other institution can obtain UD’s data from the Clearinghouse). Attach a completed UD non-FDP Subaward Cover Letter to the Attachments Tab of the UD proposal when routed for internal approvals, to be signed by the Research Office Contract and Grant Administrator. The other institution may request that we complete their Subrecipient Information form. UD is a member of the FDP, a non-profit organization comprised of Universities and other research institutions along with representatives of several research-oriented Federal Agencies. Among other activities, the FDP develops tools for its members to streamline the administration of research. One of those tools is the FDP Expanded Clearinghouse, a nation-wide database containing institutional profiles and data of 200+ member institutions. The member institutions agree to obtain the institutional data needed to prepare subrecipient agreements from this database rather than requiring each other to prepare administrative informational forms for every proposal they jointly submit. This saves a great deal of administrative work for all of the participating institutions and provides them with an easily accessible, up-to-date source of this data. Who determines if the other institution is a member of the FDP Expanded Clearinghouse? The Department Administrator or PI looks up the other institution in the FDP Expanded Clearinghouse database when preparing the proposal. Where do I get a user ID and password for the FDP Expanded Clearinghouse? You do not need a user ID or password to be able to access the FDP Expanded Clearinghouse data. How do I let the Research Office Contract and Grant Administrator know that the subaward institution is a member of the FDP Expanded Clearinghouse? Attach the other institution’s FDP-style Letter of Intent to the UD Financials Grant proposal. Do I need to send UD’s Letter of Intent template (LOI) to the other institution for them to complete? Maybe. Member institutions are likely to have their own institution’s LOI to use for proposals with other member institutions. However, you can send them UD’s LOI to use as a sample if they ask for one. Does the other institution’s Letter of Intent (LOI) need to follow the same format as UD’s FDP LOI? No, but, it should provide essentially the same project-specific information, it should not request completion of data that can be obtained from the FDP Expanded Clearinghouse, and it should be signed by the Authorized Official for the subrecipient institution. What do I do if another FDP Expanded Clearinghouse member institution asks me to complete their Subrecipient Commitment Form? Politely inform them that UD is a member of the FDP Expanded Clearinghouse and that you will provide them with a signed FDP Letter of Intent instead. When UD is a subrecipient under an institution that is not a member of the FDP Expanded Clearinghouse, can I send them a UD FDP Letter of Intent? Who uses the Letter of Intent (LOI)? The LOI is intended for internal use to represent institutional endorsement of the proposed subaward budget and scope of work by the Subrecipient’s Authorized Official. It is not designed to meet any specific sponsor’s proposal requirements, although it may be used in the proposal submitted to the sponsor if desired. The wording of the LOI may be altered slightly to add sponsor-specific requirements if it is acceptable to both institutions. Any notes/information on cost sharing – please see Third Party Cost Share Documentation. Proposal budgets are itemized by budget categories. The categories map to accounts when the proposal is awarded. Use this budget category list to guide the proposal budget process. For all personnel working on the project (PIs, Co-PIs, Graduate Students, Undergraduate Students, Post Docs, etc. ), include a brief description of their role in the project and the amount of effort in person months committed. Include the annual rate of the salary increase. NOTE: Undergraduate Students- If it is anticipated that the student will be enrolled less than half time or if they will work in the summer, fringe benefits (at the miscellaneous wage rate) should be budgeted and the rate should be stated. Graduate students can only work 20 hours per week per University policy. For the most recent undergraduate rates, check with your department administrator. There are two classifications of Post Docs at UD: Post Doctoral Researchers and Post Doctoral Fellows. A Post Doctoral Fellow designation is used for individuals primarily doing research as independent learners and are not assigned to projects as employees. A Post Doctoral Fellow is viewed as a nonemployee by the IRS. A Post Doctoral Researcher designation is used for researchers who are here primarily assigned to projects as employees for a limited period of time after obtaining their doctorate degrees. Post Doctoral Researchers receive fringe benefits (faculty/professional rate) and Post Doctoral Fellows receive no fringe benefits. For more information on the difference between these two designations, read the Proposal Guide FAQ, No. 6. Fringe benefits should be charged in accordance with UD’s negotiated rate. The most current rate can be found on the Research Office website here. This category includes items of special purpose equipment equal to or greater than $5,000 and having a useful life of one year. In this section, include details such as the type of equipment, cost, and a brief narrative on the intended use of the equipment. If multiple pieces of equipment are included, list the corresponding cost of each unit. Special purpose equipment are allowable as direct costs with prior written approval of the Federal awarding agency or pass-through entity. NOTE: F&A is not calculated on equipment costs. Software is not considered to be equipment (even if over $5,000) and should be listed in Materials and Supplies. Equipment Fabrication: Fabricated equipment means materials purchased for the purpose of building, constructing or assembling a piece of equipment that will be identified as equipment with the final cost being at least $5,000 or more and have a useful life of one year when completed. Include the same information above for fabricated equipment. F&A is not calculated on equipment fabrication. Computer Nodes: Computer nodes are considered equipment if the nodes are purchased and added to an existing computer cluster to give PIs access to the cluster. Clusters are existing pieces of equipment and when nodes are purchased, we are adding items to existing pieces of equipment that are more than $2,000 (in most cases). Adding nodes to a computer cluster gives PIs the ability to access massive amounts of space and horsepower on the cluster. If a PI needs access to an existing cluster to complete their work due to a need to access large amounts of space and horsepower, the nodes should be budgeted as equipment. Note: If a PI would like to use the existing cluster without purchasing nodes, this would not be equipment; this should be budgeted as ‘Other’ or ‘Service’. In addition, if a PI intends to purchase nodes to use in their office (not part of the cluster), this should be budgeted as supplies (in most cases) since the PI would be purchasing a large computer (unless it was over $5,000). Include all travel paid directly by the sponsor, including both foreign and/or domestic travel. It’s best to provide the following information: destination (if known), purpose of the travel, number of travelers, airfare, ground transportation, lodging, and meals/per diem (use GSA Rates). If traveling by vehicle include the number of miles and the current GSA mileage rate. Note: If travel is in excess of 6 months, dependent care costs can be requested with prior approval. Foreign travel includes a destination that requires a passport. If international travel occurs on a Federal award, Fly America must be followed. For more information see: Fly America Act. Complete the Fly America Checklist at the time the expense is made. Participant support costs are payments provided to a study participant or to a workshop attendee. These are payments FROM the grant to an individual or vendor on behalf of the individual (but not employees). These costs are expressed as non‐salary expenses for items such as stipends or subsistence allowances, travel allowances, and registration fees in connection with meetings, conferences, symposia, or training projects. These costs are allowable with the prior approval of the awarding agency. NOTE: F&A is not calculated on participant support costs. More information can be found at: here. Materials and Supplies – May include items such as software, educational or field supplies, and laboratory supplies such as chemicals, reagents, and glassware. Include a brief justification of why the material/supply is needed. Publication Costs – May include costs associated with the publishing of an article in a scientific/technical journal or other type of field/program publication, brochures, or program materials. If applicable, include student poster presentation costs. Consultants - A consultant is an individual (work-for-hire) with proven professional or technical competence, which is provided to the organization. The consultant cannot be affiliated with UD. Include the name of the consultant, his/her organization, a statement of work, and a breakdown of the amount being charged to the project (ex: number of days of service, rate of pay, travel, per diem, etc.). NOTE: F&A is calculated on consultants. Computational Devices: Computing devices means machines used to acquire, store, analyze, process, and publish data and other information electronically, including accessories (or “peripherals”) for printing, transmitting and receiving, or storing electronic information. Charging computing devices as direct costs is allowable for devices that are essential and allocable, but not solely dedicated, to the performance of a Federal award. Subawards (Also called Consortium or Contractual Costs) – A Subaward performs substantive programmatic work under a grant or contract and bears responsibility for programmatic decision making and measurable performance requirements. A justification for the subaward should include the same level of detail as your budget justification per itemized cost category. NOTE: F&A is only calculated on the first $25,000 of a subaward’s total budget. If you have multiple subawards in your budget, F&A will be calculated on the first $25,000 of each subaward. Fixed Amount Subawards (See §200.332) – With prior written approval from the Federal Agency, pass through entity may provide subawards based on fixed amounts up to the Simplified Acquisition Threshold ($150,000), providing that the Subawards meet the requirement for fixed amount awards (See §200.201). Tuition – Tuition will be charged to all grants and contracts at a rate of 20% of the total graduate tuition per the Graduate Tuition Policy found here. Exceptions to this Policy may be granted by the PI’s dean when the total funding available to the PI(s) for the project is less than $75,000 per year or in cases wherein the funding organization has a written policy precluding charging of graduate tuition to awards, and should be documented in the proposal approval routing form Current tuition rates can be found here. Include annual percent increase in the justification. Equipment Rental – When there is a need to rent equipment for use on the project, provide the type of equipment to be rented, the purpose or use on the project, the length of time needed, and the rental rate. Facility Rental – When it is necessary to rent office or other facilities spaces for project implementation, and the space(s) are located off-site from the organization’s main facility space not owned by the recipient organization, the cost of the rent may be charged against the award if the space is used specifically for the project. Include the monthly rental and/or prorated rate. For laboratory facilities, provide a letter signed by an Authorizing Representative of the rented space attesting their agreement to allow the project to operate in the space. Land-Use Charges – When there is a charge for using land owned by others for project purposes, provide the charge per acre (or other rate charged), number of acres, and total cost. User Fees – Include the type of service being charged (ex: MRI, DBI, or NMR fees), how it relates to the project, and an explanation and breakdown of the costs. Memberships, subscriptions and professional activity costs (See §200.454) — Costs of an entity’s (UD’s) membership in business, technical, professional organizations/periodicals are allowable. Costs of (individual) memberships in civic or community organizations are allowable with prior approval by the Federal awarding agency or pass through entity. Membership must be allocable and programmatically related to the project. Communication Costs – Include mailings, postage, survey supplies, faxes, and telephone long distance charges that are directly related to the project and are above and beyond normal business use. Photocopying – Include in-house photocopying of materials that are directly related to the project and are above and beyond normal business use. Service or Maintenance Contracts – These costs should be in direct correlation to the use of the equipment for the project and the performance period (ex: if an instrument is used 50% of the time for the project, only 50% of the service/maintenance costs may be charged to the project. A 5-year service contract cannot be charged to a 3-year award). Include service contract details, amount, and length of the service contract. Conferences/Meetings – Include costs of holding a conference or meeting. Some examples include rental of facilities and equipment for the meeting, translator, A/V fees, honorariums/fees for trainers or guest speakers, and travel and/or per diem costs for speakers. Itemize conference/meeting costs and include the amounts of each cost in the justification. Meals: Meal costs (non‐travel) may be directly charged on a grant/contract if it is part of a formal meeting or conference where technical information, directly related to the award, is being disseminated. For more information regarding direct charging meals to an award, read this document. NOTE: Participant support costs do not belong in this category. See guidance above for participant support costs. For guest speaker/trainer fees, include fee/rate and a description of the services provided. Housing, housing allowances and personal living expenses (See §200.445) — These costs are allowable as direct costs with prior approval of the Federal awarding agency. Examples of such costs include depreciation, maintenance, utilities, furnishings, and rent. Entertainment Costs (See §200.438) — Entertainment costs (amusement, diversion, and social activities) are unallowable unless they have a programmatic purpose and are authorized either in the approved budget for the Federal award or with prior written approval of the Federal awarding agency. Exchange Rates Fluctuation (See §200.440) — Cost increases for fluctuation in exchange rates are allowable with prior approval of the Federal awarding agency. If the PI anticipates working with foreign entities, include funds to cover foreign exchange rates. NOTE: At the time the expense is made, include documentation from a commonly used source (Ex: Oanda, XE, etc). Also see travel tools on UD Procurement website. If the sponsor allows indirect costs, include the percentage rate used, Fiscal Year, and list exclusions from indirect costs. Include the link to UD’s negotiated rate agreement. The same level of detail required for sponsor (Federal or Non-Federal) funds should be provided for any required cost-sharing/matching. Cost-sharing/matching that is not required should not be included on the budget. Any cost-share/match commitments by a 3rd Party organization must include a letter signed by the contributing organization’s Authorizing Representative. The letter should state whether the costshare/match is cash or in-kind, the amount of cost-share/match, and the purpose/use of the costshare/match. If cost-share/match is required by the sponsor, describe the cost-share/match in the budget justification. For additional information regarding UD’s cost-share/match policy, see here. Program Income is earned income to defray the program costs of the award. With prior approval of the Federal awarding agency, program income may be added to the Federal award. Program income must be used for the purposes and under the conditions of the Federal award. With prior approval of the Federal awarding agency, program income may be used to meet the cost sharing requirement of the Federal award; however, the amount of the Federal award remains the same. Departments are responsible for ensuring that employees are paid in accordance with all sponsor policies, terms and conditions, including any salary limitations they may impose. The National Institutes of Health (NIH), as well as certain other operating components within the Department of Health and Human Services (DHHS) are legislatively required to impose a cap on salaries that can be paid from the funds awarded by those agencies. The salary cap is usually adjusted on an annual basis and the current salary limit should be determined by consulting the Salary Cap Summary on the NIH website when developing budgets1. Salaries for employees whose Institutional Base Salary (IBS) exceed the DHHS salary cap should be budgeted using the cap amount and include a statement in the budget justification indicating that the salary has been budgeted at the cap. The amount of the employee’s salary that exceeds the DHHS cap must be funded from non-sponsored sources. No sponsored project may be used to cover the difference in salary between the cap and the actual salary amount. 1Operating divisions within the DHHS that are subject to the salary cap include but are not limited to: the National Institutes of Health (NIH), the Agency for Healthcare Research and Quality (AHRQ), the Substance Abuse and Mental Health Services Administration (SAMHSA) and the Health Resources and Services Administration (HRSA). The cap is mandated by Congress in the annual federal appropriation to DHHS and as such the components of DHHS to which it applies may change from time to time. It is therefore prudent to check the policy of the component of DHHS that is awarding the grant to determine if the salary cap applies. For assistance, contact your Contract and Grant Administrator in the Research Office. Since the DHHS salary cap is based on a 12 month salary, we must annualize the employee’s salary to determine if the employee’s salary exceeds the cap. For example, if an employee’s full time salary for a nine month contract is $170,000, you annualize the salary by dividing it by 9 and then multiplying by 12 ($170K/9*12=$226,667). If the employee’s annualized salary amount is greater than the salary cap amount, his/her salary is over the cap. When this is the case, you must determine how much of the salary can be direct charged to the federal award and how much must be cost-shared on a non-sponsored source. The portion of effort which can be charged to the grant = effort * salary cap/annualized salary. The portion which must be recorded as cost-share = effort * (1 – (salary cap/annualized salary)). Example: A PI has an annualized salary of $226,667, the applicable salary cap is $185,100, and the PI has committed 25% effort to the project. How much of the 25% effort can be charged to the grant and how much must be recorded as cost-share? The percent of the employee’s effort being committed to the proposed project is not the same as the percent of the salary cost being direct charged to the award funds. The effort being committed to the project by the employee is the sum of the percent of the salary direct-costed to the award + the percent paid as cost-share. The breakdown into the two percentages allocated to each funding source is not specified in the proposal budget or budget justification. The proposal budget and budget justification should show 25% effort (3 months effort) However, the dollar amount budgeted in the Sponsor’s proposal budget for the employee’s committed effort should be the amount that will be direct costed on the award only. Please contact the Research Office Jeff Friedland. Salaries that are determined to be administrative and meet the criteria above must be budgeted accordingly in the UD financial system. For exempt administrative staff, the budget category to use in the People Soft proposal is ADMEXEMPT and for non-exempt administrative staff the budget category to use in People Soft is CLERK. For exempt administrative staff the budget ps account to use is 120000. The individual should be paid from the appropriate salary expense ps account. For non-exempt administrative staff the budget ps account to use is 123000 with the appropriate salary expense ps account used for expenses. If administrative salaries were not included in proposal submission and funds awarded by the sponsor, you will need prior approval from the federal or federal flow through sponsor before you allocate administrative salary expenditures to the award. Revisions to sponsored project budgets that require sponsor prior approval must be reviewed and approved by the Research Office. Once approval is received from the sponsor, if the budget revision is to be done within one project a FIN Budget Revision – Contracts and Grants webform should be processed by the department. This will rebudget the funds into the correct budget ps accounts. If the budget revision is to be done between sponsored projects on the same award, the process will be managed by the Research Office. The Facilities and Administrative Cost-Rates Agreement defines “equipment” as an article of non-expendable tangible personal property having a useful life of more than one year and an acquisition cost of $5,000 or more per unit. Please direct any questions relating to this policy to your Contract and Grant Administrator. The University of Delaware Facilities and Administrative (F&A) rates below are for use on grants, contracts and/or other agreements issued or awarded to the UD. These predetermined rates are effective July 1, 2018- June 30, 2021. ABOVE RATES: These rates are applied to the Modified Total Direct Costs (MTDC) base. Click here to download an excel version. Please route all the requests for cost shares and letters of support requiring UD leadership support through the Associate Vice President for Research Development. Encourage the PI’s and Research Deans to engage with the Research Office (RO) as early as possible through the Research Development Office. Use email researchdev@udel.edu for communication to the Research Office. Standard equipment match requests should follow the Equipment Cost Share policy and be communicated to the RO at least 1 week in advance of the submission date. RO should be notified at least 2 weeks from the submission date for proposals with substantial match such as non‐equipment match. Large/complex proposals, such as Major Research. Instrumentation grants, or proposals involving more than one college, generally require very substantial university cost share commitments and therefore need even more lead time. Unless F&A is limited by the sponsor, any reductions of F&A, including its use as cost share need to be communicated to the RO at least 2 weeks in advance. Letters of support that involve language for cost shares need to follow Cost Share schedule noted above. See also #3 below. At least 5 business days before proposal submission date for letters of support that need President or Provost signature. 3 business days for letters of support that need VP for Research support. The PI and/or respective Research Dean must provide a draft summary for such letters and key points that must be emphasized in the LOS paying careful attention to the solicitation’s guidelines. The full Fringe Benefits Rate Agreement can be found here. Modified Total Direct Cost (MTDC) consists of: salaries and wages, fringe benefits, materials and supplies, services, travel, the first $25,000 of each subaward, Equipment (defined as an article of nonexpendable tangible personal property having a useful life of more than one year and an acquisition cost of $5,000 or more per item), capital expenditures, patient care costs, rental costs, tuition, scholarships and fellowships, participant support costs and vessel (ship) costs. The following expenditures are excluded from the MTDC Base. NOTE: These rates are negotiated annually. Current University of Delaware graduate per credit base and adjusted rates for specific programs can be found on the Graduate and Professional Education Office’s website. UD Deans have made adjustments to the base tuition rate in specific programs that reduce the per credit cost. For all activities performed in facilities not owned by the institution, the off campus rate will apply. (For all activities performed in facilities rented with institution funds, the on campus rate will apply). Grants or contracts will not be subject to more than one indirect cost rate. If more than 50% of a project is performed off campus, the off campus rate will apply to the entire project. “Subaward monitoring” is a popular buzz phrase in the research administration world. But many of us hear that and think, Am I supposed to be doing something about that? And, what does that mean, anyway? The truth is, the Department Administrator plays a key role in carrying out effective subaward monitoring. Below you will find resources from the session covering this topic at the 2018 Research Administration Conference. There often exists a question over whether funds from a foundation or other (non-federal) organization are to be treated as gifts or sponsored awards. The two are very much intertwined. Awards may be received as either a gift or in the form of a sponsored agreement. In certain situations, a gift may be administered out of the Office of Sponsored Programs Administration, located in the UD Research Office, or jointly with the Development office; these determinations are made at the time of the solicitation/proposal. For additional information download the documentation on Research-Related Gifts and Sponsored Agreements. Many federal agencies, including the National Institutes of Health (NIH) and most recently the National Science Foundation (NSF), are requiring that grant applications contain data management plans for projects involving data collection. Beginning January 18, 2011, proposals submitted to NSF must include a supplementary document of no more than two pages labeled “Data Management Plan” (DMP). This supplementary document should describe how the proposal will conform to NSF policy on the dissemination and sharing of research results. According to the NSF Grant Proposal Guide, the DMP will now be reviewed as an integral part of the proposal. Proposals that do not include a DMP will not be able to be submitted. Data description: Brief, high-level description of the information to be gathered; the nature, scope and scale of the data that will be generated or collected. Content and Format: Formats in which the data will be generated, maintained, and made available, including a justification for the procedural and archival appropriateness of those formats. Access and sharing: Indicate how you intend to archive and share your data and why you have chosen that particular option. This should include a description and rationale for any restrictions on who may access the data under what conditions and a timeline for providing access. This should also include a description of the resources and capabilities (equipment, connections, systems, expertise, repositories, etc.) needed to meet anticipated requests. These resources and capabilities should be appropriate for the projected usage, addressing any special requirements such as those associate with streaming video or audio, movement of massive data sets, etc. Statement of plans for metadata content and format, including description of documentation plans and rationale for selection of appropriate standards. Existing, accepted standards should be used where possible. Where standards are missing or inadequate, alternate strategies for enabling data re-use and re-purposing should be described. Intellectual Property Rights Protection: Statement of plans, where appropriate and necessary, for protection of privacy, confidentiality, security, intellectual property and other rights. Security: A description of technical and procedural protections for information, including confidential information, and how permissions, restrictions, and embargoes will be enforced. Selection and Retention Periods: A description of how data will be selected for arching, how long the data will be held, and plans for eventual or termination of the data collection in the future. Archiving and Preservation: Description of plans for preserving data in accessible form. Plans should include a timeline proposing how long the data are to preserved, outlining any changes in access anticipated during the preservation timeline, and documenting the resources and capabilities (e.g., equipment, connections, systems, expertise) needed to meet the preservation goals. Where data will be preserved beyond the duration of direct project funding, a description of other funding sources of institutional commitments necessary to achieve the long-term preservation and access goals should be provided. Storage and Backup: Storage methods and backup procedures for the data, including the physical and cyber resources and facilities that will be used for the effective preservation and storage of the research data. Responsibility: Names of the individuals responsible for data management in the research project. *This particularly important when working with multiple PIs and/or collaborative partners. These aids are provided in pdf format. Am I eligible to serve as a principal investigator (PI) on a research proposal? * Principal Investigator/Co-Principal Investigator status may be rescinded for cause. If an exception is made to make someone an eligible PI and that person isn't a full-time University employee, the chair or dean must be a co-PI on all proposals for that person. Some faculty members wish to continue their research programs after retirement from the University, but do not qualify for status as principal investigators because they are no longer full-time UD employees. Retired faculty members may apply for PI status using the existing Research Office PI approval form. If the request is approved, retired faculty members may serve initially as co-PIs on proposals with a full-time faculty member as PI (this would typically be the department chair or another senior faculty member). If the proposal is funded and the retired faculty member is hired to work on that grant, he or she may then serve as the PI during the life of the grant. At the time of hiring, the retired faculty member may be appointed to an appropriate professional staff position (such as, for example, senior research fellow), but under no conditions may be re-hired on the faculty (as, for example, a research professor). The Research Office acknowledges the importance of permitting graduate students to lead sponsored projects where appropriate. There are several sponsors who offer pre-doctoral grants whereby the work is conceived of and carried out entirely by a graduate student. In these cases, a faculty member is identified as a mentor and oversees the project nominally. (examples: NASA: Harriett G. Jenkins Predoctoral Fellowship Program (JPFP), NIH: Ruth L. Kirschstein National Research Service Awards for Individual Predoctoral Fellowships (F31) to Promote Diversity in Health-Related Research, NIH: Predoctoral Training at the Interface of the Behavioral and Biomedical Sciences, DOE: The National Methane Hydrates R&D Program - Graduate Fellowship Program). To that end, the eligible PI approval form may be used at the time of proposal routing to permit the graduate student to have this role. Also, please have the department administrators ensure the graduate student’s supervisor code is associated with a chair and dean code. This will allow the proposal approval web form to be routed appropriately. The required completed form must be sent to the Research Office at least ten (10) working days before the deadline for submittal of the proposal to the funding agency. There are still other sponsors for whom the need for submission and approval from an Authorized Representative of the University is not required. The student may submit these applications directly to the sponsor without coordination with the Research Office or a PI eligibility form (examples include: NSF Fellowship, Ford Foundation Diversity Fellowships for Achieving Excellence in College and University Teaching). If there are questions concerning which type of funding the grad student is applying, contact the Research Office for guidance. Serving as a Principal Investigator (PI) at the University of Delaware brings significant rewards and confers concomitant responsibilities. PIs are responsible for the intellectual direction of research and scholarship and for the education and training of students. In carrying out these critical tasks, PIs are also responsible for compliance with laws and regulations that touch on all aspects of the research enterprise. To ensure compliance with applicable rules, regulations, and contract requirements the University of Delaware requires all PIs to receive training in the financial management of sponsored projects. Developed for PIs already at the University, the University's training program focuses on stewardship of funds, mandatory reporting requirements and particularized training in the fundamentals of federal grant and contract accounting. PIs must complete mandatory training before the University will release project funding. What is a conflict of interest and do I have a conflict? As defined in the University of Delaware's Policies and Procedures Manual, "a conflict of interest occurs when there is a divergence between an individual's private interests and his or her professional obligations such that an independent observer might reasonably question whether the individual's professional actions or decisions are influenced by considerations of personal gain, financial or otherwise. A conflict of interest depends on the situation, and not on the character or actions of the individual.” For further information on conflict of interest click here. Where can I find Funding Opportunities? An excellent way to identify potential sponsors is to network with faculty, industry representatives, and government agency personnel. Funding opportunities for sponsored research are available to UD-eligible principal investigators from a variety of federal and state agencies and private foundations. Information on limited submission opportunities, General University Research (GUR) grants and UD Research Foundation (UDRF) grants are also available on the Funding Opportunities page. Another excellent tool for identifying potential funding opportunities is the Community of Science database, which is available to UD employees through a paid subscription from UD's Morris Library. Library staff periodically offers workshops on effective use of the database. What should a researcher do before submitting for funding? Or I've found a funding opportunity that is the right match for my research. What are my next steps? 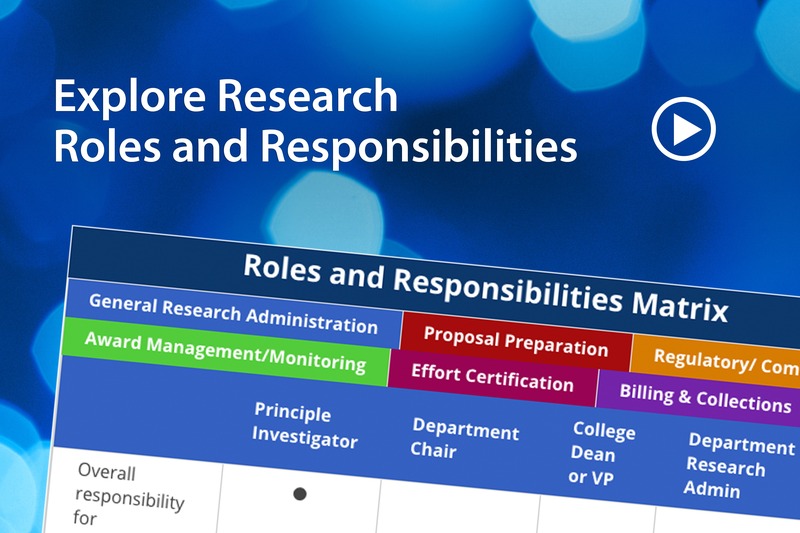 Familiarize yourself with UD's Responsible Conduct of Research. Compliance with UD's code of conduct, policies, and procedures is critical. If human subject or animal subjects or will be using hazards materials, for example, would be used in your research project, you must abide by specific policies and complete specific forms and reviews as part of the proposal application. You'll find links to all of UD's policies and procedures and required forms here. Allow enough time to develop the proposal and meet the agency's funding deadline. Competitive applications often reflect the input of multiple colleagues, and large, multidisciplinary and multi-institutional projects require a great deal of advance planning even before writing the proposal can begin. Keep in mind that the Research Office needs a minimum of 72 hours — three business days prior to the agency deadline — to process your proposal or it will not be submitted to the sponsor. Submit keywords through the Employee Demographic Data (EDD) form prior to submitting a proposal. The Proposal Key Word are used to track proposals by subject category (for example: disease, avian, solar) and to link multiple science codes to projects. These identifiers are important for reporting both internally and externally by science categories. Please see your department administrator for assistance with the EDD. Know if "cost-sharing" is required by the funding agency. "Cost-sharing" refers to the University's commitment of funds, equipment, or services toward the project, beyond the funding that would be provided by the agency. Typical examples include equipment, personnel effort, and tuition. If cost-sharing is required, you need to find out if your dean would approve this cost before proceeding. Notify your departmental research administrator of your proposal plans. This individual works in partnership with a Contract and Grant Administrator in the UD Research Office. You can locate your department's research administrator on our Staff Directory Web page. This individual can help you learn the ropes by assisting you in the completion of required forms and in answering questions about cost rates and other details related to the development of your budget. If your proposal is for a federal grant and will need to be submitted via Grants.gov, this individual can help answer your registration questions. Find a faculty mentor. A junior faculty is encouraged to seek a faculty mentor. Some departments assign a mentor to a new faculty member. A senior faculty can guide a proposal process, from writing to submission. How do I develop a competitive proposal? You need to have good, innovative ideas, an understanding of the funding agency's mission and goals, and pay careful attention to the theme and requirements specified in the funding announcement. A good proposal should be compelling, understandable, well-organized, grammatically correct, exhibit correct spelling, and it must meet the due date, formatting, and length requirements specified in the agency's guidelines. If you've carefully read the agency's funding announcement and have specific questions about a proposal idea, consult the program officer at the funding agency for advice or clarification. If changes to the letter are required, you will be notified.The Research Office will shepherd the letter and proposal to the appropriate UD administrator for signature and provide a copy to you for your files. If your proposal requires an evaluation component, an excellent resource to consult on campus is the UD Education Research and Development Center. If your proposal requires "Broader Impacts" in informal public education and outreach, contact the Research Communications Initiative in the UD Office of Public Relations for advice. The office participates in selected proposals and also is aware of other units on campus who are involved in public education and outreach that may be available to assist you. As you draft your proposal, make sure to cross-reference your content with key themes and requirements indicated in the funding announcement. Ask colleagues with experience writing winning proposals to read your draft and provide constructive criticism. You might also ask to serve on an upcoming proposal review panel for a particular agency to gain further insight into how proposals are evaluated. Developing competitive research proposals is hard work, but the rewards can be great in terms of future discoveries. It's important not to be discouraged if your proposal is not funded, but to learn from the experience and prepare for the next opportunity. The solicitation requires that my proposal be submitted electronically. How do I obtain access to various electronic submission site (example: Fastlane, ERA Commons, NSPIRE, etc)? If you are intending to submit a proposal to NSF you will need access to Fastlane. Please send an email request to your Contract and Grant Administrator with the PI's name, birth date, type of degree and the year it was received so the new PI can be added to FASTLANE. Please note Fastlane will provide the PI with a NSF login number that will become part of their personal logon process. PI's name, birth date, any previous NIH user names and if the PI has had any previous NIH grants, we will need the grant number. Please note the Research Office will establish the User Name but eRA Commons will provide the PI with a password. If you intend to submit a NASA proposal you will need to register with NSPIRE. This registration will create a request at the Research Office to allow the new user to be affiliated with the University of Delaware. The University of Delaware is registered in Grants.gov. Individuals cannot register to submit proposals on behalf of the University. Only your Contract and Grant Administrators in the Research Office can submit proposals as the Authorized Organization Representative (AOR) for the University of Delaware. How do I route a proposal approval form for signatures? Any time a new proposal is submitted to a sponsor, or an increase in the funding or University resources occurs (in the case of a re-budget or renewal) a Proposal Approval Form must be routed. In the case of a renewal where the resources are less than expected, or there is NO change, a form NEED NOT be routed. A proposal record must be created in UD Peoplesoft Grants system to originate the form. Work with your department administrator to create the record and submit the proposal for routing. I found a solicitation that limits the number of proposals that can be submitted. What is the UD Research Office proceedures on Limited Submission Proposals? Many federal agencies and foundations offer grants, awards, and fellowships that limit the number of applications that can come from one institution. In order to increase the chances of UD succeeding in such "limited submission opportunity" applications, UD Research Office has established procedures for reviewing pre-proposals for such competitions in a timely fashion. Do pre-proposals require UD Research Office approval? Any time the University is obligating resources or requesting funds, the UD Research Office must be included in the submission. A Pre-proposal to a sponsor must go through the UD Research Office routing for approval and official submission through institutional signatures. I am preparing a letter of intent, does it have to be signed by the Research Office? Letters of Intent (LOI) that do not address funding amount or UD commitments (ie; time commitments/match etc.) do not require signature of the Research Office (unless required by sponsor). However, the Research Office should be copied on the LOI. Typically, the purpose of this type of intent is for sponsor to determine the amount of man hours required for review process. Keep in mind that it is helpful to notify your Contract and Grant Administrator when you become aware of any proposal submissions so they can better serve the needs of the faculty. Who at University of Delaware signs as the authorized representative for proposal applications? What basic information should be on the SF424 for a Grants.gov proposal submission? The Standard Proposal Information will provide you important key elements related to the University. (example: DUNS number, Tax Identification Number/TIN, CAGE code, etc.). What are the important points I should know when preparing an NIH Grants.gov application? Please review the Frequently Asked Questions for Electronic Research Administrations, Question 3. Where do I find more information about NIH Grants.gov application procedures? Where can I find the NSF Grants.gov application guidelines? Where do I find information regarding sponsor guidelines? Please review the Grants Management Guide for further information. How do I construct a budget? The attached spreadsheet is a guide to assist you in building a budget for your proposal. Download Excel file. Where can I find research funding? A good starting point is our Funding Opportunities page. It includes information on the Community of Science database, which is accessible by UD employees, in addition to links to the Web sites of key federal agencies that support research. Information on limited submission opportunities, General University Research grants, and UD Research Foundation grants also is available here. I've found a research opportunity that is right up my alley. What are the next steps? First, familiarize yourself with UD's Responsible Conduct of Research. Compliance with UD's code of conduct, policies, and procedures is critical. If human or animal subjects, for example, would be used in your research project, you must abide by specific policies and complete specific forms and reviews as part of the proposal application. You'll find links to all of UD's policies and procedures and required forms here. From a practical standpoint, you need to make sure you have enough time to develop your proposal and meet the agency's funding deadline. Competitive applications often reflect the input of multiple colleagues, and large, multidisciplinary and multi-institutional projects require a great deal of advance planning even before writing the proposal can begin. Keep in mind that the Research Office needs a minimum of 72 hours — three business days prior to the agency deadline — to process your proposal, or it will not be submitted to the sponsor. More background on the policy is available here. From a fiscal standpoint, you need to know if "cost-sharing" is required by the funding agency. "Cost-sharing" refers to the University's commitment of funds, equipment, or services toward the project, beyond the funding that would be provided by the agency. Typical examples include equipment, personnel effort, and tuition. If cost-sharing is required, you need to find out if your dean would approve this cost before proceeding. With the appropriate administrative approval, the next thing to do is to notify your departmental research administrator of your proposal plans. This individual works in partnership with a contract-and-grant representative in the Research Office. You can locate your department's research administrator on our Staff Directory Web page. This individual can help you learn the ropes by assisting you in the completion of required forms and in answering questions about cost rates and other details related to the development of your budget. If your proposal is for a federal grant and will need to be submitted via Grants.gov, this individual can help answer your registration questions. You need to have good, innovative ideas, an understanding of the funding agency's mission and goals, and pay careful attention to the theme and requirements specified in the funding announcement. A good proposal should be compelling, understandable, well-organized, grammatically correct, and exhibit correct spelling, and it must meet the due date, formatting, and length requirements specified in the agency's guidelines. E-mail the letter to your contract-and-grant administrator in Research Office. To locate the correct staff member, see the Department Administrator directory in the Staff Directory. If changes to the letter are required, you will be notified. Research Office will shepherd the letter and proposal to the appropriate UD administrator for signature and provide a copy to you for your files. If your proposal requires an evaluation component, an excellent resource to consult on campus is the UD Education Research and Development Center. If your proposal requires "Broader Impacts" in informal public education and outreach, a great external resource is the National Alliance for Broader Impacts Guiding Principles and Questions. Internally you are encouraged to contact the Research Communications Initiative in the UD Office of Communications and Marketing for advice. The office participates in selected proposals and also is aware of other units on campus who are involved in public education and outreach that may be available to assist you. Please follow this link to Data Management Plans. My proposal has been funded! Now what do I do? At this point, notify Research Office, your dean, and departmental research administrator with the good news, as well as the UD Office of Communications & Marketing, which may issue a news release about your award. You should then work closely with your departmental research administrator in establishing your research project account, or "Purpose," in UD PeopleSoft. You'll find all the guidelines for setting up the award, maintaining it, and closing it out in our online Grants Management Guide. And while you may just be beginning your grant now, be sure to review the Grant Management Guide on "Protecting Your Results," which includes our online Intellectual Property Guide and important policies, and tour the Technology Marketplace. Also, don't miss the "Presenting Your Results" section of the Researcher's Toolbox for helpful advice on preparing for media interviews, developing scientific posters, presenting public lectures, garnering UD and external media coverage of your research, and more. Remember, research is an important part of our mission here at the University of Delaware, and you have serious responsibilities as a UD research investigator. We want to make sure you are familiar with our requirements and help facilitate your research success. If you have any questions, contact us at udresearch@udel.edu. Good luck with your research! What is the difference between Post Doctoral Fellow and Post Doctoral Researcher? The title of "Post Doctoral Fellow" is designed for people who are at the University doing research primarily as independent learners, not on assigned projects as employees; the “Post Doctoral Fellow” designation is akin to an advanced graduate student, and the IRS specifically views post doctoral fellows as non-employees. While there are Post Doctoral Fellows at the University who fit this description, there are also some who currently have this designation but are not eligible under existing UD policy, IRS regulations, or visa status. These people must be handled differently. Therefore, there exists the job title of "Post Doctoral Researcher" for researchers who are here primarily to work on assigned projects as employees for a limited period of time after having obtained their doctorates. Questions regarding processing forms for post doctoral researchers, tax implications, etc., should be directed to HR systems administration. Questions concerning visa status should be directed to Foreign Student and Scholar Services. The position of Post Doctoral Researcher should be used when appropriate instead of Post Doctoral Fellow. The question of when this is appropriate is an academic judgment to be made primarily by the Dean in the context of the individual’s actual activities and Visa status. Post Doctoral Fellows’ primary responsibilities are comparable to those of graduate students: expanding their own knowledge, and often working with and guiding graduate and undergraduate students. The responsibilities of Post Doctoral Researchers are comparable to those of employees, where payment is dependent upon fulfilling an assigned work plan. The following guidelines should be considered by Deans making the judgments. Individuals with H1B Visa status cannot appropriately be classified as Post Doctoral Fellows. For U.S. citizens and for others when Visa status is compliant, such as permanent residents and those who hold F-1 and J-1 Visa status, initial appointments may be made for one year as a Post Doctoral Fellow, as long as the Dean approves that this is consistent with the expectations of the appointment. The letter of appointment should stipulate the responsibilities in a manner that is congruent with such an appointment and should be signed, or otherwise approved, by the Dean. Beyond the initial year, Deans will determine on an empirical basis whether the appointment should be as Post Doctoral Fellow or Post Doctoral Researcher based on the actual activities of the individual. When Visa status is compliant, two years is expected to be the maximum length of time for someone to hold Post Doctoral Fellow status, unless there is continuing external funding specifically for a Post Doctoral Fellow for a longer period. When Visa status is compliant, current Post Doctoral Fellows should be reviewed by the Dean and a judgment should be made as to whether they are appropriately classified as Fellows, or whether they should be Post Doctoral Researchers or some other classification. The timing of that review may coincide with the end of the Post Doctoral Fellow’s current funding. That is, they may continue in this classification until the end date of their current funding source, at which point the Dean should review their classification in the context of the individual’s actual activities. How do I gain secured access to the Grants system for proposal submission and inquiry? I have a Post-Doc listed in my NSF proposal budget. What should I include in my Mentoring Statement? The attached "Sample" Mentoring Statement is not meant to be used as a UD standard but is meant to be used as guidance to assist faculty in meeting the NSF proposal requirement. I am preparing a NIH application that involves human subjects and I see there is an entire section of the Research Plan that is devoted to Human Subjects. What should be addressed in this section? In this section, you’re required to address three areas: inclusion of human subjects, inclusion of women and minorities, and inclusion of children. Please see the attached document for details on this section of the Research Plan. 1. How do I obtain access to People Soft grants module? 2. How do I go about getting a letter of support for my research project from the UD administration (Deputy Provost for Research Office, Provost, or President)? 3. When do I need to route a Proposal Approval Form for signatures? Any time a new proposal is submitted to a sponsor, or an increase in the funding or University resources occurs (in the case of a re-budget or renewal) a Proposal Approval (web) Form must be routed. In the case of a renewal where the resources are less than expected, or there is NO change, a form NEED NOT be routed. 4. Do Pre-Proposals require Research Office approval? A Pre-proposals to a sponsor must go through the Research Office routing for approval and official submission through institutional signatures. Any time the University is obligating resources or requesting funds, the Research Office must be included in the submission. 5. I am preparing a Letter of Intent, does it have to be signed by Research Office? Letters of Intent (LOI) that do not address funding amts. or UD commitments (ie; time commitments/match etc.) do not require signature of the Research Office (unless required by sponsor). However, the Research Office should be copied on the LOI. Typically, the purpose of this type of intent is for sponsor to determine the amount of man hours required for review process. Keep in mind that it is helpful to notify your Contract and Grant Specialist when you become aware of any proposal submissions. 6. What is the process for getting our new faculty access to Fastlane? Send PI's name, birth date, type of degree and the year it was received to your Contract and Grants Specialist with a request to add the PI to FASTLANE. Please note Fastlane will provide the PI with a NSF login number that will become part of their personal logon process. 7. Who at the University of Delaware signs as the Authorized Representative for proposal applications? 8. What is the procedure for a Sponsored Research Program Income? For information on Sponsored Research Program Income Procedures, follow this link. 9. How to avoid common problems and increase submission success regarding PDF documents? To easily create PDFs from other documents (including creating ‘flat’ PDFs from PDFs with active fields), you can use a standalone PDF creation utility such as those recommended by Grants.gov, or built-in features such as “Save as PDF” in other software programs. Give the document a short and unique attachment name using letters, numbers, and underscores. When submitting to NIH, follow their PDF submission guidelines to prevent problems. Avoid ‘bundling’ multiple PDFs into a single file or producing PDFs by scanning printed documents. Disable any security features in the document. Do not attach PDFs that contain “stamps” (commonly used for signatures) or other comments. PDF files submitted to the eRA Commons are converted to images, and applications not following these guidelines may not convert correctly. It is always advisable to review your submitted application in the eRA Commons system and check that attachments were transmitted accurately. The University of Delaware Research Office is open from 8 a.m. to 5 p.m. Monday through Friday. The Research Office is closed Saturday and Sunday and observes all University closings and holidays. See the Academic Calendar for more information.